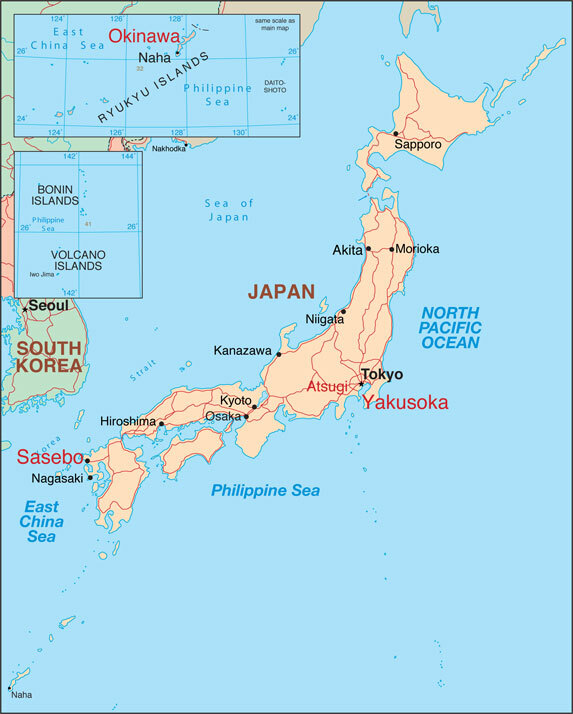 Japan is an island nation in the Pacific Ocean, off the coast of East Asia, about the same size as Montana. The four largest islands are Hokkaido, Honshu, Shikoku and Kyushu. The population is about 127 million, and the terrain is mostly rugged and mountainous. The largest of the four main islands, Honshu, is also the most important economically and culturally. Not only does it have the two largest cities, Tokyo and Kyoto, but also the beautiful, almost symmetrical Mount Fuji; Nagano, which hosted the 1998 Winter Olympics, and the U.S. Navy's Atsugi Air Facility. On the serious side, it is also the location of Hiroshima, the target of the world's first atomic bomb. Tokyo offers a surprising blend of futuristic cityscapes, historic sights and cultural entertainments. The Ginza is one of Asia's shopping paradises. Prices are high but the selection and presentation are superb. Nearby is the Imperial Palace (closed to the public) with its impressive moat and East Garden (Higashi Gyoen). Early risers will enjoy touring the massive waterfront Tsukiji Fish Market. Tokyo Disneyland is a major year-round attraction for Japanese and foreigners alike. Kyoto, with a vast number of temples, shrines, museums and historical sites, remains Japan's star attraction. 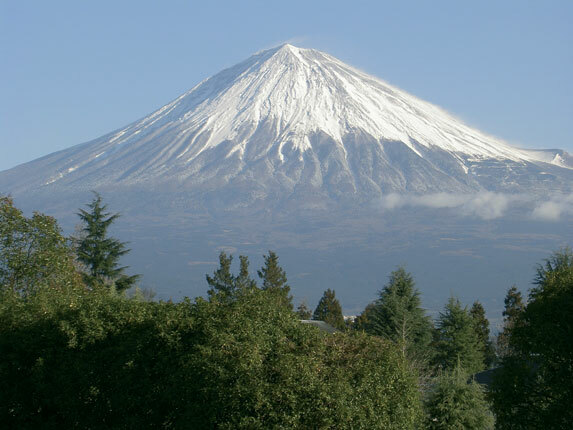 Mount Fuji may be climbed during the high summer, and the area around Nagano abounds in skiing and hot spring resorts. Hiroshima has risen from the ashes to become a thriving modern city, and is the location of the Peace Memorial Park and Museum, commemorating the bombing. The other city to get the atom bomb, Nagasaki, is on the southernmost main island of Kyushu, very close to the U.S. Navy's Sasebo Base. It's famous for its Peace Park and also is the location of the Glover House, said to be the setting that inspired Puccini's opera Madame Butterfly. When getting a hotel room ask if your room has a bed. The Japanese sometimes sleep on futons on the floor, and consider them very comfortable. Also if you visit a Japanese home, remember that it is inappropriate to wear shoes inside. The climate varies from tropical in south to cool temperate in north. Shop hours in Japan are usually from 10 or 11 to 7 or 8. Most stores are open weekends and holidays except some specialty stores. The graceful act of bowing is the traditional greeting. However, the Japanese have also adopted the western custom of shaking hands, albeit with a light grip and perhaps with eyes averted. Avoid hugging and kissing when greeting. Believe it or not, there is no tradition for tipping in Japan. In fact, waiters might even feel insulted if you try it. Things are expensive enough without a tip. Rice is basic to Japanese cuisine. You'll get lots of dishes that include it and it is even the basis for their favorite alcoholic beverage, sake. The Japanese take fish and seaweed along with their rice (think sushi), and the ritual drinking of tea is impressive. It is common in restaurants to sit on tatami mats on the floor around low tables. If you prefer a chair and a standard table, they're available, as are knives and forks if you can't handle chopsticks. If Japanese cuisine isn't to your taste there are plenty of international restaurants. The 1,249 acres of Naval Air Facility Atsugi is about 16 km west of Yokohama and 36 km southwest of Tokyo. It's home to the only complete co-located forward deployed air wing, Carrier Air Wing FIVE. 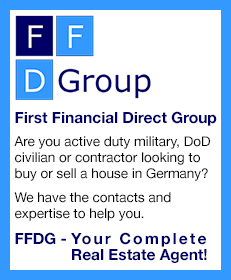 Its mission is to provide facilities, services and material support for U.S. Navy and Marine Corps aviation operations, and to provide logistic support for the carrier wing. With approximately 10,000 personnel, Atsugi is like living in a small town. The weather is hot and humid in the summer, chilly to cold in the winter. Though the subtropical island of Okinawa accounts for less than one percent of Japan's land, it hosts about two-thirds of the 40,000 American forces in the country. Many of these troops are marines and plans are afoot to move most of them to other bases in the Far East. Okinawa's clear turquoise seas and many fine beaches mean that it has long been a holiday favorite among the Japanese. Numerous coral reefs offer excellent diving opportunities, with many resorts catering to enthusiasts. The large U.S. bases nearby help to fuel its lively nightlife. Perhaps the most unique characteristic of the military presence on Okinawa is that, unlike most duty stations, the Marine Corps' Camp Butler is physically separated throughout the island into seven different camps. Navy presence on Okinawa includes Commander Fleet Activities, Okinawa with its tenant commands and the U.S. Naval Hospital on Camp Lester. Naval facilities are physically located throughout Okinawa (on Kadena Air Base, Camp Shields and White Beach Naval Facility). There is also a significant Air Force and Army presence on Okinawa located at Kadena Air Base and Torii Station. 13 hours ahead of East Coast U.S. 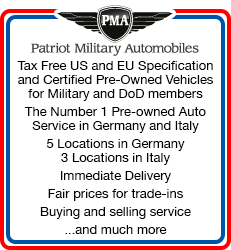 There are also US Army and Air Force insallations in Japan. Misawa Air Base is approximately 400 miles north of Tokyo, on the northeastern part of the main island of Honshu. Unlike the Tokyo area, this region of Japan is rural and known for it's slower pace of life. Yokota Air Base is located on the island of Honshu, Japan, on the Kanto Plain, 28 miles northwest of Tokyo at the foothills of the Okutama Mountains. Yokota is both a US and UN base, and is primarily a UNC airlift hub. The Camp Zama Army community is comprised of three main housing areas on mainland Japan: Camp Zama, Sagamihara and Sagami Depot. All three are located in Kanagawa Prefecture, about 25 miles southwest of Tokyo. There are also several satellite locations located in Yokohama, Kure, Tokyo and other areas.